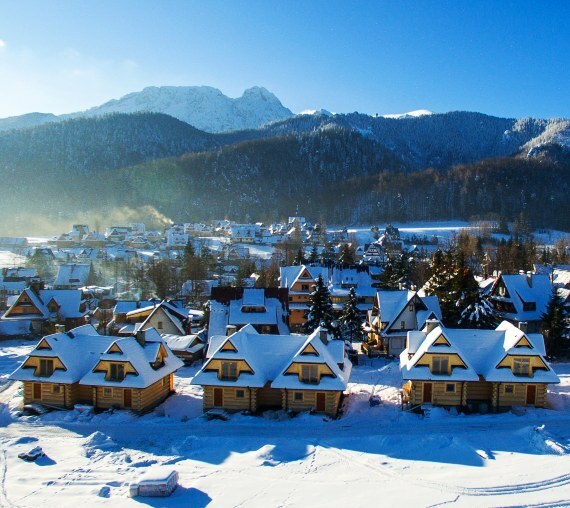 Welcome to our luxurious and peaceful settlement at Budzowski Wierch in the capital of the Polish Tatra Mountains – Zakopane! Our cottages – built from wooden logs – are located in a quiet area alongside Krzeptówki street with a view of the mountains – you can see the Sleeping Knight on one side and admire Gubałówka and Polana Szymoszkowa on the other. Our settlement is located at an altitude of 900 meters above sea level, away from the hustle and bustle – you can relax while breathing the clean air. The distance from the center (Krupówki) is only 2.5km, which makes our picturesque place unique – it is an excellent starting point and at the same time a place simply created for relaxation. We value the discretion and safety of our guests greatly, the whole facility is fenced and closed by a remote control gate. We have a spacious parking lot! The settlement on Budzowski Wierch borders directly with the ski lift and there are entrances to the trails nearby – the Chochołowska Valley, Kościeliska Valley or Lejowa Valley. We offer you 8 luxurious log cottages and an apartment in a wooden house. The cottages are equipped with fireplaces – which in combination with the unique scent of the wood from which the cottages are built – creates a magical mix. In addition, taking care of the comfort of our guests – each cottage has its own bath for outdoor bathing (also known as the Norwegian sauna). This allows you to enjoy views both during the day and at night (starry sky) – regardless of the season. We await you in these unique natural circumstances!